My laboratory is focused primarily on studying the mechanisms underlying neurologic disease in animals utilizing both spontaneously arising disease and experimental models in a variety of laboratory animal species. One current focus of my lab is in validating the dog as a model for human brain cancer, primarily meningeal and glial tumors. This is being done through a variety of histologic, immunohistochemical, and molecular studies in both the dog and cat. We are especially interested in determining the roles that novel gene mutations have in the genesis of canine and feline meningioma and are utilizing RNAseq to better understand the transcriptome of this tumor. We are also actively involved in studying the immune cell microenvironment in canine brain tumors in order to determine if a relationship exists between immune cell infiltration and postsurgical outcome. Other research projects included characterizing novel causes of neurologic disease in companion animals and studying other spontaneously occurring neoplasia in the dog, namely soft tissue sarcomas. Lastly, I provide pathology support to a variety of research collaborators throughout the United States including Dr. Tricia Burdo at Temple University and Dr. Ken Williams at Boston College. 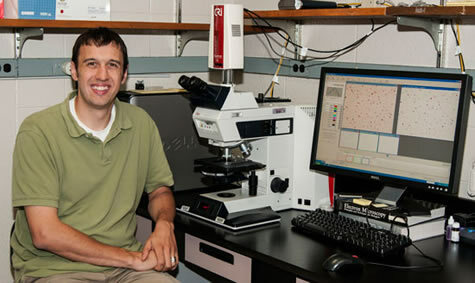 Dr. Andrew Miller is an Assistant Professor and the Anne Groot Sesquicentennial Fellow in the College of Veterinary Medicine. I am a diplomate of the American College of Veterinary Pathologists (ACVP). I received my doctorate in veterinary medicine from Cornell University in 2005 and completed a residency in veterinary anatomic pathology at Cornell University in 2008. I joined the faculty at the New England Primate Research Center, a division of Harvard Medical School as a research associate in 2008. I had achieved assistant professor by 2013 and held an appointment in the Pathology Department of the Massachusetts General Hospital during my tenure at the primate center. I joined the faculty in the Section of Anatomic Pathology as an Assistant Professor at Cornell University in fall of 2013. I have a strong interest in training veterinary students and pathology residents and preparing them for a career in comparative veterinary pathology. I believe that this is best done through hands on exposure to clinical cases and basic research techniques. I am involved nationally in the ACVP and other pathology groups including the Canine Brain Tumor Consortium, a consortium organized through the National Cancer Institute. I strongly believe in the integration of teaching and collaborative research as a way to foster continued growth in the field of comparative veterinary pathology. Undergraduate and veterinary students routinely rotate through my lab and I mentor a number of pathology residents on research projects during their residency. Kent M, Glass EN, Castro F, Miller AD, de Lahunta A. Masticatory myositis in a gray wolf (Canis lupus). J Zoo Wild Med, 2017, 48(1):245-249. McBride R, Sloma E, Erb H, Miller AD. Immune cell infiltration in feline meningioma. J Comp Path, 2017, 156(2-3):162-168. Walker J, McGrath M, Miller AD, Burdo T, Williams K. Direct Targeting of Macrophages with Methylglyoxal-Bis-Guanylhydrazone Decreases SIV-Associated Cardiovascular Inflammation and Pathology. J Acquir Immune Defic Syndr, 2017, 74(5):583-592. Rissi D, Miller AD. Canine spinal cord glioma: A case series and a review of the literature. J Vet Diag Invest, 2017, 29(1):126-132. Finno C, Kaese H, Miller AD, Gianino G, Divers T, Valberg S. Pigment Retinopathy in Warmblood Horses with Equine Degenerative Myeloencephalopathy and Equine Motor Neuron Disease. Vet Ophth. 2016, epub Aug 5. Lakritz JR, Thibault D, Robinson J, Campbell J, Miller AD, Williams KC, Burdo TH. α4-integrin antibody treatment blocks monocyte/macrophage traffic to, VCAM-1 expression in and pathology of the dorsal root ganglia in a SIV macaque model of HIV-peripheral neuropathy. Am J Path. 2016, 186(7):1754-1761. LeBlanc AK, Mazcko C, Brown DB, Koehler JW, Miller AD, Miller CR, Bentley RT, Packer RA, Breen M, Boudreau B, Levine JM, Simpson MR, Halsey C, Kisseberth W, Rossmeisl Jr, JH, Dickinson PJ, Fan T, Corps K, Aldape K, Puduvalli V, Gilbert MR. Creation of an NCI Comparative Brain Tumor Consortium: Informing the translation of new knowledge from canine to human brain tumor patients. J Neurooncol, 2016, 18(9):1209-1218. Finno CJ, Miller AD, Siso S, Divers T, Armien AG, Gianino G, Barro MV, Valberg SJ. Concurrent equine degenerative myeloencephalopathy and equine motor neuron disease in three horses. J Vet Intern Med, 2016, 30(4):1344-1350. Handley SA, Desai C, Zhao G, Droit L, Monaco CL, Schroeder A, Nkolola JP, Norman ME, Miller AD, Wang D, Barouch DH, Virgin HW. SIV infection-mediated changes in the gastrointestinal bacterial microbiome and virome are associated with immunodeficiency and prevention by vaccination. Cell Host Microbe, 2016, 19(3):323-335. Choi E, Childs-Sanford SE, Abou-Madi N, King E, Caserto BG, Priest H, Behling-Kelly E, Miller AD. Hepatic osteodystrophy in a golden lion tamarin (Leontopithecus rosalia). J Zoo Wild Med, 2016, 47(3):907-911. Choi E, Sloma E, Miller AD. Kir7.1 immunoreactivity in canine choroid plexus tumors. J Vet Diag Invest, 2016, 28(4):464-468. DiVincenti L, Miller AD, Knoedl D, Mitchell J. Primary uterine rupture in a common marmoset (Callithrix jacchus). Comp Med, 2016, 66(3):1-5. Whitaker EE, Bissonnette B, Miller AD, Koppert TL, Tobias JD, Pierson CR, Christofi FL. A novel, translational use of a piglet model to study the effects of anesthetics on the developing brain. Clin Trans Med, 2016, 5(1):2. Guo W, Miller AD, Pencina K, Wong S, Lee A, Yee M, Toraldo G, Jasuja R, Bhasin S. Joint dysfunction and functional decline in middle age myostatin null mice. Bone, 2016, 83:141-148. Lakritz JR, Robinson JA, Polydefkis MJ, Miller AD, Burdo T. Loss of intraepidermal nerve fiber density during SIV peripheral neuropathy is mediated by monocyte activation and elevated monocyte chemotactic proteins. J Neuroinflamm, 2015, 12(1):237. Sloma EA, Erb HE, Creneti C, Miller AD. Characterization of inflammatory changes associated with canine oligodendroglioma. J Comp Path, 2015, 153(2-3): 92-100.